The Commodore experience is centered around our crisp, modernist rooms. We offer two basic classes of accommodation: Cabins—elegant, yet minimal European-style sleeping rooms with shared bathroom facilities; and Suites—more spacious chambers with full en-suite baths and lounging areas. 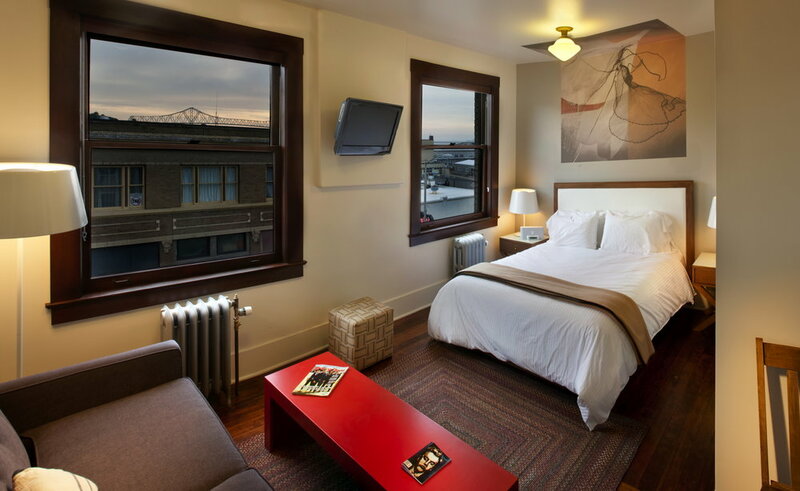 All rooms are provided with a flat screen LCD/DVD combo, radiant heat, and premium bathrobes. For guests in cabins and deluxe cabins, we offer luxurious restrooms and showers at the end of each hallway―ample size, appointed with modern touches. We offer several rooms that accommodate pets. Ask about pet rates when you make your reservation.